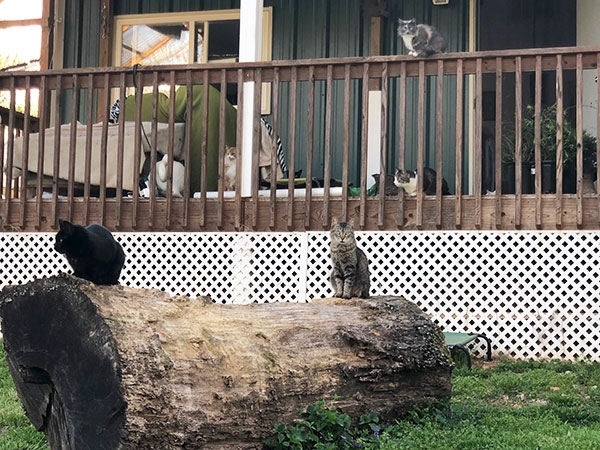 Based in Northwest Arkansas, Blind Hope Cat Sanctuary is a 501c3 non-profit organization dedicated to providing a permanent and loving home to special needs cats. The majority of the cats at our Sanctuary were rescued from euthanasia at shelters or through the process of Trap-Neuter-Return (TNR). Blind Hope Cat Sanctuary was formed to address the need for a permanent, cage-free home for cats deemed "unadoptable" by animal shelters. Many shelters often euthanize cats who are blind, injured, FIV+, elderly or have other issues that label them as unadoptable. We only accept special-needs cats from local shelters so we can continue to provide the high quality care they require and deserve. We support and promote the value of ALL feline lives through spay/neuter programs and by promoting Trap-Neuter-Return (TNR) as the most humane method available to control the issue of cat overpopulation. We also provide educational workshops for the public on TNR and Caring for Orphaned Kittens as a means to reduce the burden to shelters and prevent euthanasia due to lack of space. We believe that every cat in our community should be treated with compassion. 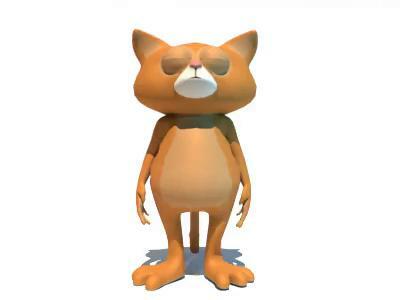 Our goal is to provide the training to ensure the community has the tools to help cats in need. Our sanctuary is home to cats that are blind, injured, FIV+, elderly or have other issues that label them as "unadoptable". We believe these cats deserve a safe and loving environment to live their lives. No one takes a job expecting to end up running a cat sanctuary seven years later. But that's exactly what happened when our founder, Leticia Stivers, began working at the Austin Humane Society in 2007. Her job was to help start and manage a new feral cat program that employed a method of population control called Trap-Neuter-Return (TNR). She assisted the public with their cat problems, collaborated with animal control on cruelty cases, and coordinated a group of 75 volunteer cat trappers. She also did quite a bit of actual trapping, especially in the beginning. What she saw and heard on a daily basis would break your heart. So many animals in need. But the cats that truly tugged at her heart were the special-needs cats. Those cats whose options were few and would likely be euthanized. So in the Fall of 2013, construction began on her seven acre property to build a standalone building that would serve not only as the cat sanctuary, but also as her office and art studio. The building was created with the cats' comfort and well-being in mind. It has a kitchen, bathroom, laundry area and lots of storage. The cat room has three large windows with 12" deep window sills - perfect for bird watching! There are two cat doors, one that leads onto the deck and another that leads to the side of the building. We created cute boxes specifically for the cats to jump on or sleep in and mounted them along the walls. Creating vertical spaces for them was important. But most importantly was adding an HVAC system for the building. It gets far colder up here than Austin so we had to make sure the cats would be comfortable in winter and summer. The building is also nicely insulated. But what good is a sanctuary without the ability to enjoy the great outdoors safely? A deck was built attached to cattery so the cats can go outside for fresh air and listen to the birds. The deck is 10 feet wide x 30 feet long with a 12 ft. roof overhang. An enclosure was built beyond the building to allow the cats to be cats. We moved in two large tree trunks from a tree that had toppled over on our property. One stands perfectly vertical to allow the cats to climb to the top and sit. For the ferals of the sanctuary, we included four feral "houses" that were generously donated to us by the Humane Society of the Ozarks. These houses are great for the unsocialized cats to hide in while we work in their yard or if a sudden rainstorm comes up. Since the sanctuary is located in the country, the cats needed protection from predators; especially the blind cats. So a full sized net was affixed over the entire enclosure to protect them from hawks. The chain link fence is buried 8" into the ground to prevent the cats from digging out or predators from digging in. Every gap was closed and secured. 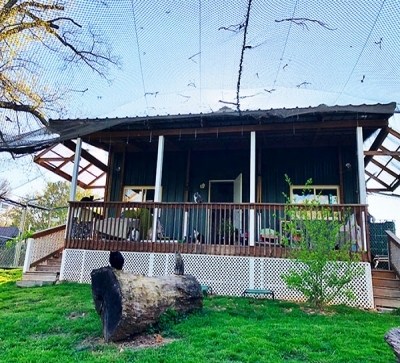 After adding a green privacy barrier to the chain link fence and a few bird feeders on the exterior of the enclosure, the area was ready for the cats. Moving a bunch of cats from Austin to Northwest Arkansas was no easy task. But after a long nine hour drive, they all arrived safe and sound. The cats arrived in the late winter and before the enclosure was complete. So they remained indoors for several months. It was important that they acclimated properly. The window sills soon became prime real estate! Once spring arrived and we started having nicer weather, the cats were finally allowed to explore their new outdoor playground. It was a hit ... they loved it! They rolled in the dirt, they ate grass, and they climbed and scratched the tree trunks. We were so happy to be able to provide them a comfortable and safe home.